Back before Memorial Day I switched out the decorations on the porch from spring to patriotic for the summer holidays. 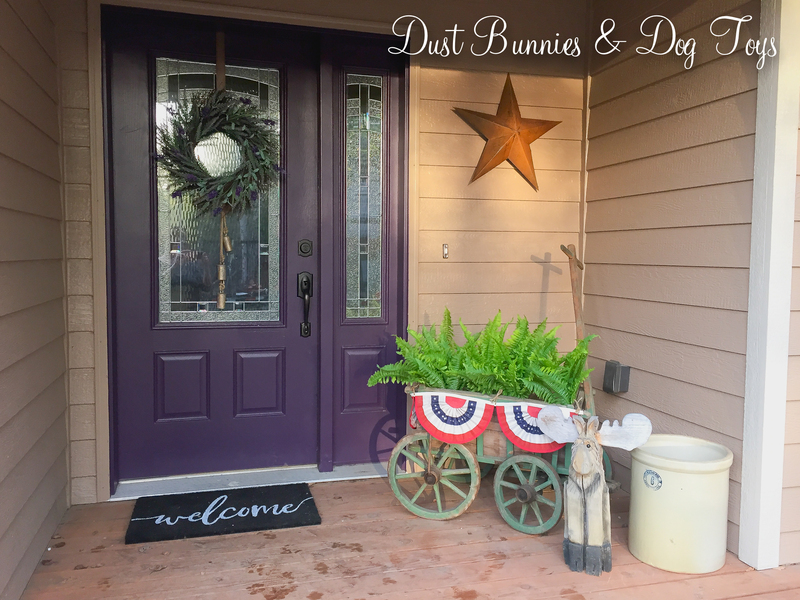 I usually decorate with simple red, white and blue items for the whole season to celebrate Memorial Day, Flag Day, Independence Day and Labor Day. That takes me from May all the way through early September without having to update anything, which is perfect for those already busy summer months. 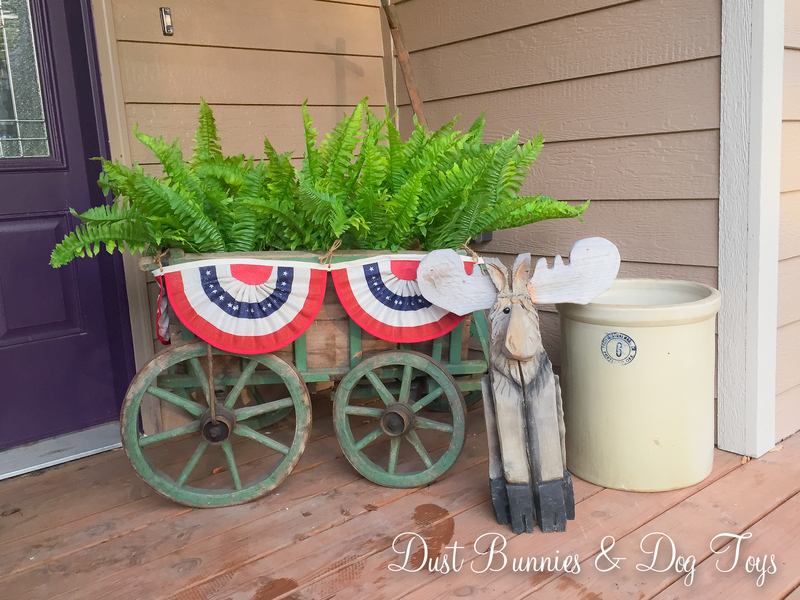 I added faux ferns to the little vintage cart I got at the Junk Bonanza show, so I don’t even have to water anything. A cute little patriotic bunting from JoAnn’s makes it festive. I plan to add some birch logs to the crock, but if I don’t get around to it before the end of the summer that’s ok. Our little moose statue rounds out the display with that sweet wooden face. The metal star I already had on the porch works well with this set-up so I left it up. I’ve traded my various holiday door mats for a classic welcome that will work throughout the year. It was one of my best finds at Home Goods on our trip to Portland back in April. The vintage bells I got at the Alaska Chicks’ Spring Market were added to a wreath I already had. It’s my simple nod to “let freedom ring” and the blooms on the wreath tie in with the door color. I also added a couple small flags to the potted plants on the steps, but forgot to get a picture of them. And since I didn’t get a chance to share the spring set up back when it was in use here it is for comparison. J A few faux bouquets from the clearance bin at Michaels that can double as photo shoot props and my cute new Mr. Bun Bun from Pier One thanks to a gift card and coupon I won during their Enchanted Spring Open House event. A bird house from my ever-growing collection tied it all together. 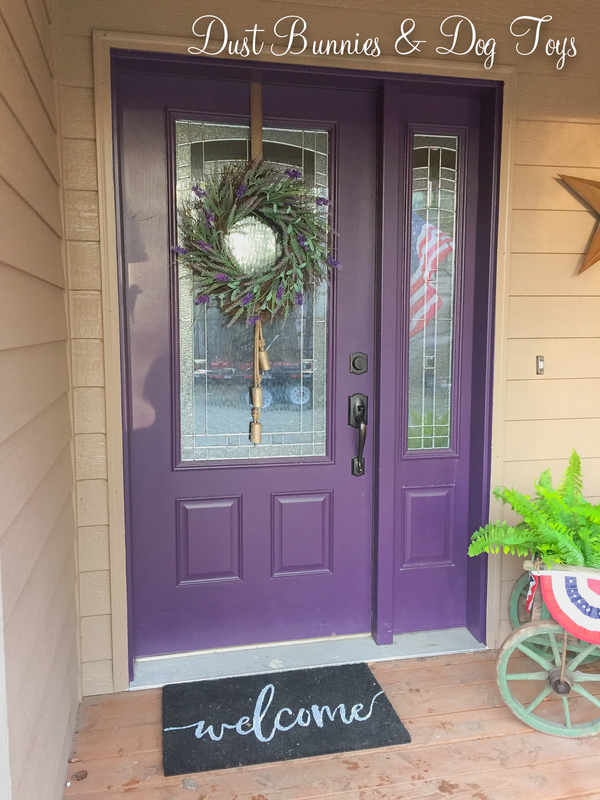 Do you decorate your porch for summer or for the patriotic holidays? I’d love to see! Leave me a comment with a link so I can check out your decorations! 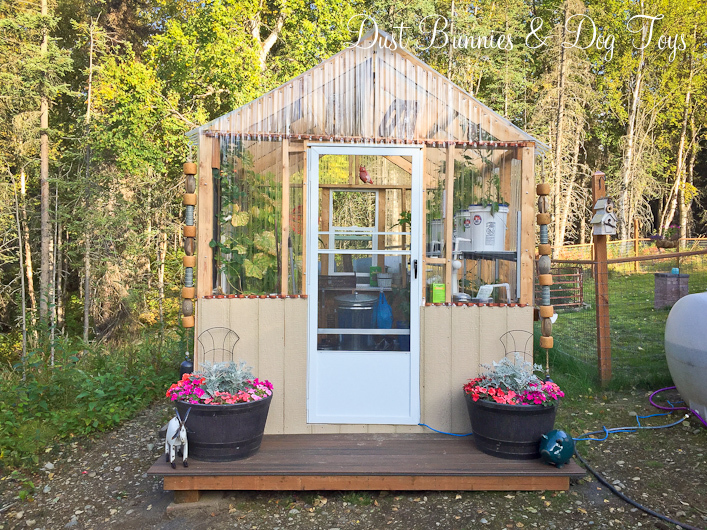 I certainly wasn’t going to turn down his help or an option that required less prep work – especially as we enter the last few weeks to get outdoor projects done before winter arrives in Alaska. 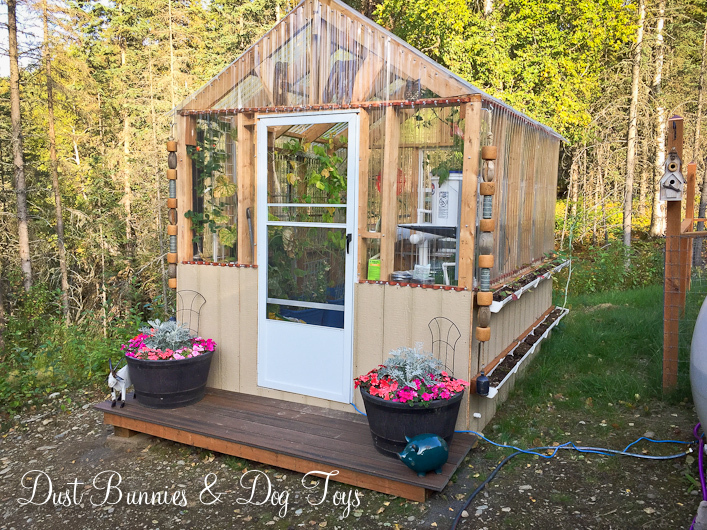 He built a simple frame from some some left over pressure treated boards left over from building the new deck and attached it to the frame of the green house on the front. Because the ground slopes here we used paver bricks to support the frame so we could get it level. Once we had it attached we pulled out the pavers and the Hubs added a support post using a scrap piece of 4×4, also from the deck construction. 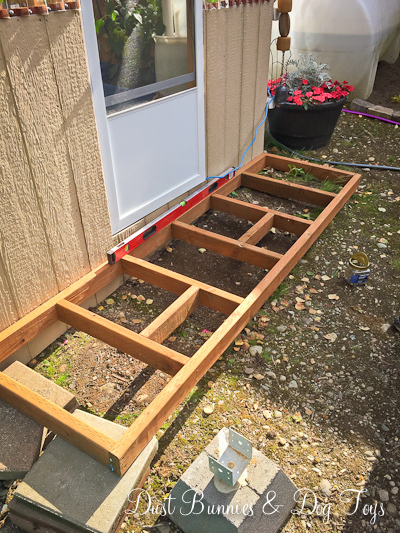 I was busy getting a new flower bed installed next to the shed (I’ll be sharing that update next week) so I didn’t get a picture of that step but you can see it in the edge of the finished photo. I plan to add fill dirt around the front, side and back of the green house to level things out a bit more before we spread gravel over the whole area around the green house. 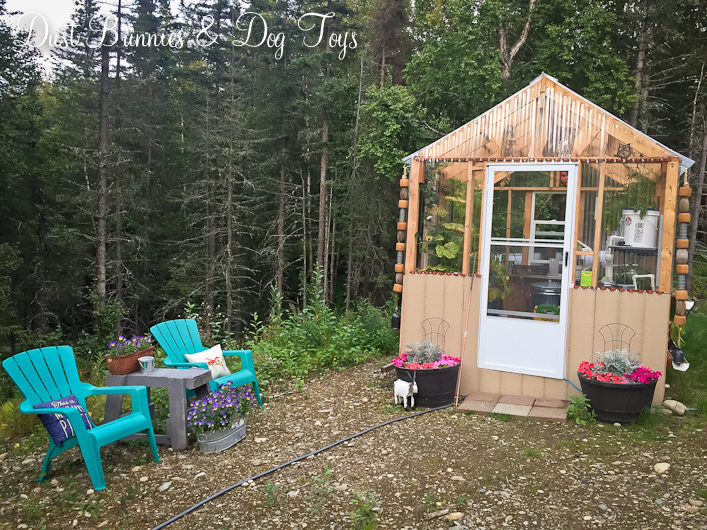 It’s amazing how much that little change elevates the look of the whole green house! I absolutely love it and can’t wait to see it finished off with the gravel around it. Now I just need to find a metal R at Alaska Picker Day tomorrow so I can complete the “GROW” sign I plan to add to the top of the front. 🙂 If I find some good treasures I’ll be sharing those next week as well! 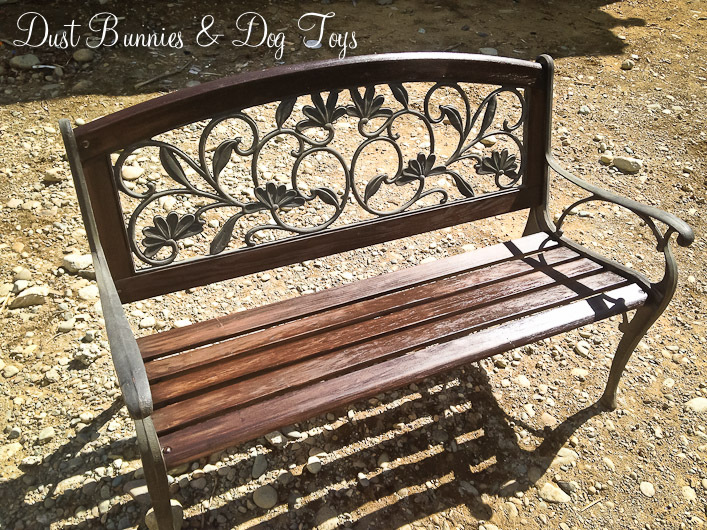 Remember my $25 bench? This is what it looked like when we first got it. It was pretty enough, but it was definitely worn and in need of some TLC. 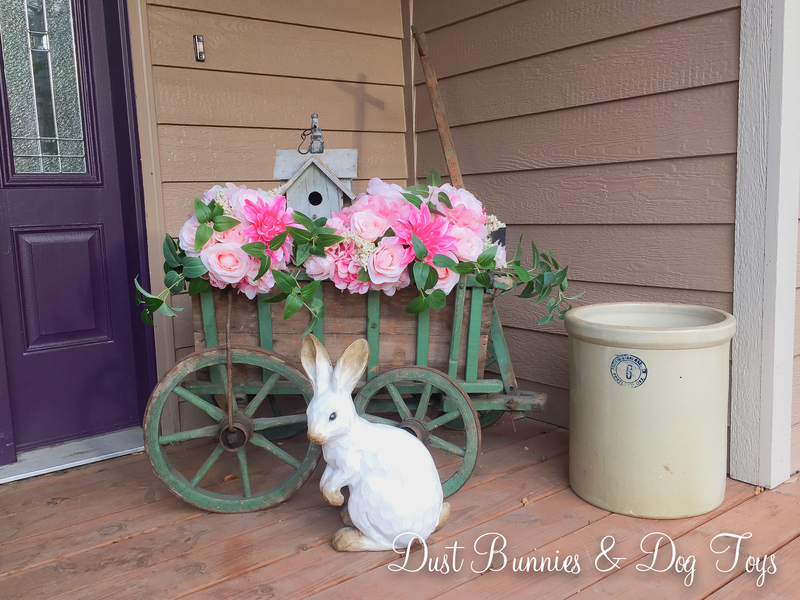 This weekend the sun was shining and I just couldn’t resist doing projects outside. 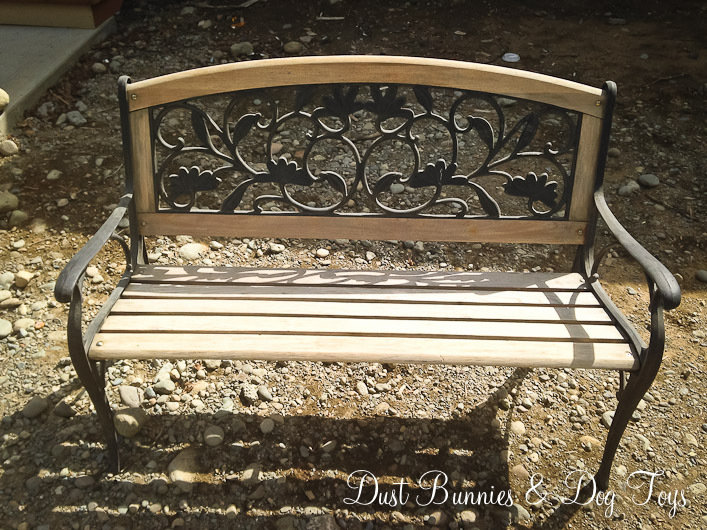 Since my yard is still on hold while waiting for the builder to clean and grade our lot, I focused my energy on other outdoor tasks like updating the bench. 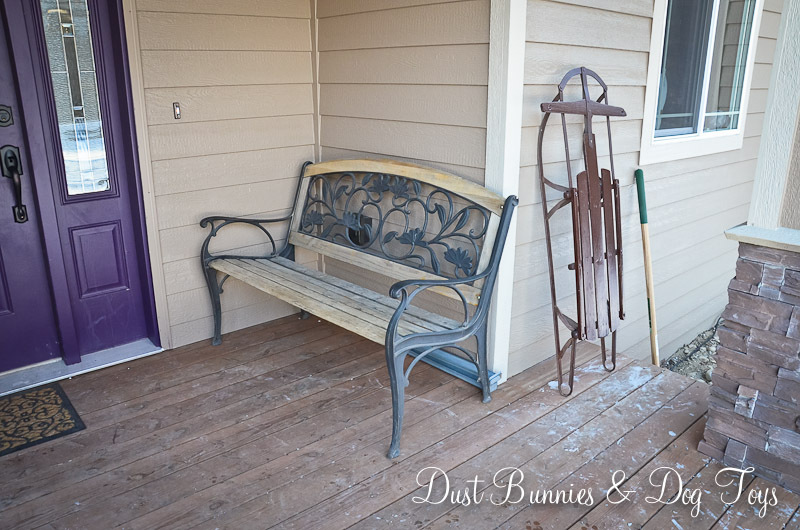 While the fur babies played in the yard, I moved the bench out to the driveway and did a quick sanding by hand to even out a few rough spots. Next, I applied a dark stain we had on hand and about 30 minutes later, this was the result! It looks a meeeelllion times better and I didn’t spend a dime! It just doesn’t get better than that!